When you need an elegant look, but dont require the privacy, aluminim fencing can give you the protection and look of a top quality fence. 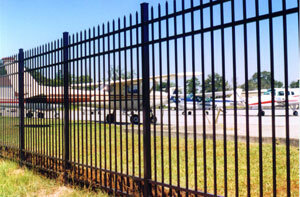 In the Delta, aluminum fence has been one of several specialty fences we install. With quality products and top knotch craftsmanship, you can be assured your aluminum fence with last years in Lousiana. Aluminum Fence is used in the Delta because of it’s versatility, affordability, and durability. It requires very little maintenance, is lightweight, and is not susceptible to corrosion. This makes aluminum fences look great for years even though they are exposed to the elements. Aluminum is cheaper than steel and is 100% recyclabl. Just as strong as other cost effective materials. No Staining or Painting necessary. Aluminum fencing is best used for residential garddens, yard and pool fencing, and is ideal for seasside or waterside homes. This is because of it’s resistance to corrosion. Aluminum cost less than steel but does require a higher cost than wood. But do to maintenance free nature of aluminum fencing, it will cost less in the long run. Aluminum can be bent, so it cannot be effectively used for tough barriers or security on industrial or commmercial areas. High security fencing is usually recommended for these such facilities. This entry was posted in Fence Facts and tagged aluminum, cons, delta, fence, pros. Bookmark the permalink. ← Game Fence, a Necessity in Louisiana.